It’s been said a thousand times that WordPress is the best platform when it comes to Blogging. Moreover if you have some coding knowledge (Basic PHP, HTML & CSS) then your blog will certainly rock. Last week I posted few ways to Increase the PHP Memory Limit in WordPress. Today I thought of posting few tips to Display Thumbnails in your WordPress excerpts. In simple terms the word ‘excerpt means – a shorter version of an entire blog post. It’s a known fact that images speak much more than words, So placing a thumbnail on the main page of your blog is much essential for both SEO as well as to increase the CTR. If you style it well, then you’ll certainly make a few of your site visitors stick on your site for a longer period. I’ll not be making a long list all the available methods, Instead I will be giving out a couple of methods to display Thumbnails on the main page of your blog. WordPress 2.9 came out with an effective feature of Featured Images. It allows you to upload images which will help you in displaying Thumbnails in your Post Excerpts. But this feature is not activated by default in most of the WordPress themes. So you need to first activate it by adding a two-line code in your functions.php file present in your theme’s Directory. Now open the Index.php file present in your theme’s Directory & add the code just below the Post Excerpt. This code will display Thumbnails on your Index page. If you are not a coder, please do not mess with php; it can bring your site down very quickly. So I would recommend you to make use of plugins to do the job for you. Yes, using plugins certainly increases your site’s memory usage, but you need to bear with that aspect as it does the job for you without much efforts from your side. Out of the many Thumbnail plugins; I found ‘Thumbnail For Excerpts’ to be the most promising out there. So go ahead and Download Thumbnail For Excerpts. In case you face any difficulty, despite of trying the above two methods, feel free to submit your query as a Comment. If this post helped you to Display Thumbnails in Excerpts, then you can Subscribe to Our RSS Feeds / Daily Updates. Meanwhile just take a look at the Top 10 WordPress Plugins which I use on DailyBlogging. Have you faced problems when you first setup your blog for post thumbnails ? Which method did you use ?? Thanks a lot for this tutorial. Was wondering on this from a long long time! How do I apply this in thesis theme ? That’s a good piece of info, especially for newbies. nice tut mani..thanks for shairng..
Great post! You can also ensure that post thumbnail will be fetch in social media site. Thanks for the quick tutorial. Thumbnails will make posts more interesting and easy on the eyes! The first method you described seems to only add a Featured Image and not a thumbnail below my excerpts. If no featured image is specified for a given post, nothing is displayed. Additionally, the Thumbnail for Excerpts plugin simply does not work for my blog. I can get the default image to display, but it fails to retrieve thumbnails for posts containing images from the media library / gallery. Essentially I just want my excerpts to choose the thumb from the first image in my posts. If no image is present I want to default to the category icon for the post. Hello, I have installed “Thumbnail for Excerpts” plugin on my WordPress blog. But, I want to style thumbnails using style.css file. The plugin FAQ says that I should create a class named “wp-post-image” in my style.css file, but when I create the class in style.css, it does not work. I think, there is some bug in this plugin. If you find any solution for this problem, then please let me know. 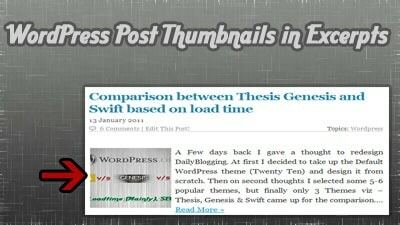 I’m using Thumbnails for Excerpt version 2.1 on WordPress 3.0.1.2. Thank you for your help and for a great plugin! Hi Charles Luvianos right here, that was in fact bizarre. I just composed an really endless remark at http://www.dailyblogging.org/wordpress/excerpt-post-thumbnails-wordpress but once I clicked publish my personal comment failed to display. Sigh… well Now I am not writing all that text all over again. Regardless, merely wanted to say superb blog site! Good info. I tried the plugin but I think it’s conflicting with the style with the rest of my website. The image won’t align to the left, even when that is selected in the plugin. Regardless, thanks for the help. Thanks for the information provided. I installed the Plugin “Thumbnail For Excerpts” and its working. Can we add border to the thumbnails, if yes then how ? However, I used the Parament Theme and I want the thumbnail of each article only on the homepage, category & search results. – The first one make repeat the thumbnail on the home page & on the post. – The second one make appear the thumbnail on homepage , category & search result but the excerpt disapear & an automatic one is created by Thumbnail For Excerpts. Moreover the link “Continue Reding dispaear”. How can I fix this problem of Thumbnail. I forget to mention that all my excerpt are made using in every post. I am unable to get my text to show to the right of my thumbnail images on my website http://www.simplerevisions.com. I am using the Genesis framework and Pretty Little Child Theme. I have downloaded Thumbnail for Excerpts and still no luck. Any suggestions? I would be most appreciative. 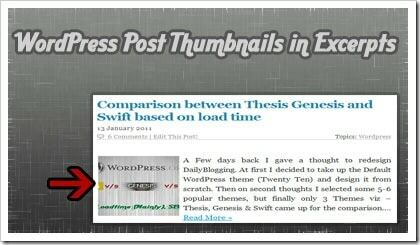 It’s good plugin http://wordpress.org/extend/plugins/thumbnail-for-excerpts/, i’ve used this plugin for some site. Recently, I switched from Genesis to mythemeshop but was not sure with their theme so rather purchasing any premium theme I thought to try with their free theme first. But the experience was worst – they don’t help in their support forum. I just heard from someone that this plugin will help me fix my issue with the theme. I read your post and installed it on my blog but it is not working. Can you please check my blog and tell me what to do next? I want to display thumbnail on posts in blog’s homepage. Thanks for sharing the link to that great plugin! day. You cann’t consider simply how so much time I had spent for this information! Thank you!